I've loved science fiction since childhood. Captain Kirk and the crew of the Enterprise always captured my imagination by propelling me into strange new worlds full of adventure and the wonder of discovery. It didn't stop with Star Trek, though. Over the years I've read an enormous amount of science fiction. Because there are very few Christian science fiction writers most of what I have read has been by non-Christians. Now while I always knew there were conflicts between my Christianity and unbelieving sci-fi, it wasn't until I discovered the discipline of apologetics (particularly its emphasis on worldview thinking) in my early twenties that the deep nature of this conflict dawned on me. I soon learned to enjoy the books and shows for what they were but to critically watch for expressions of anti-Christian worldviews. Some of the best practical lessons I learned in this period were not from my Christian philosophy books, but from various episodes of Star Trek: the Next Generation. The truism that in modern cultural products "God is utterly conspicuous by His absence" was never more evident to me than in my science fiction journeys during this period. But while I critically enjoyed these cultural products of those outside my worldview, I gradually developed a deeper understanding of the very meaning of culture and of modern Christianity's radical failure to sanctify modern life under Christ's lordship. I can now appreciate the wisdom and profound sense of loss that Reformed author Douglas Wilson expresses in the pithy phrase, "We Christians used to build great cathedrals; now we toss Gospel-frisbees". Culture is an inescapable reality of our existence. As creatures made in the image of an intensely creative God, we cannot help ourselves--we are inexorably driven to create, or rather, to "subcreate" (as J.R.R. Tolkien and C.S. Lewis, both outstanding Christian authors, put it), and the products of our creative activities make up our culture. Culture is the spiritual and moral and intellectual air we breathe; we can no more successfully escape it than a fish can from water. So far so good, but what does any this have to do with science fiction? Simply this: Modern culture lives and moves and has its being within a worldview that goes by various names--naturalism, secularism, modernism--but which has one central characteristic: its orientation towards things "scientific". One reason why the popular imagination esteems science fiction is because we have all been conditioned to view ourselves as cogs in the vast impersonal Machine of "the Universe", which obliviously grinds along crushing our hopes and dreams beneath its inexorable wheel. Our best and only hope is to master some small part of our environment through technology, and because our remarkable successes in the twentieth century show no signs of abating many atheists believe that we will one day (if we have not already) take control of our own evolution--our own fate--through technology. This is, in fact, a major theme of many science fiction universes. Much of twentieth century science fiction revolved about just this sort of "Science as Divine Revelation of Reality" paradigm. Having no room for the harmonious Medieval vision of "the three faces of culture" (truth, beauty, and goodness) integrated under the personal governance of Christ, Enlightenment philosophy (particularly Kantian agnosticism and Lessing's "ugly ditch" between religion and the real world) systematically reduced every aspect of human culture to an introspective, stoically defiant gaze into the stygian abyss of "existence". Thus, while beauty and goodness have become the exclusive properties of "the eye of the beholder", truth has been relegated to the sterility of "the scientific method", which promises to produce technological mastery of every environment--and perhaps one day even of our very souls. Science fiction picked up on this theme and drove it home into the minds of generations of unreflective, rootless souls. But the Enlightenment paradigm and the science fiction that feeds on it has an abiding problem--human life is not reducible to what can be analyzed and quantified in a laboratory. Any reflective human being (science-lover or no) knows this. Culture, the air we breathe, cannot be merely a function of "What Science Says". The "human equation" must be elevated above the Machine. No matter what we think we are, we cannot escape what we actually are. And we are men, not machines. Much of the angst-ridden conflict between "Modernism" and "Postmodernism" has revolved around this realization. There are signs that although the latter did not win the battle to relativize all knowledge it has significantly altered the former's brazen, sterile, technological triumphalism. Culture, especially in terms of the humanities, has made a comeback as increasing numbers of people have realized that for all the good Science gives us, it cannot give us the things that really matter. For at least the last fifteen years, science fiction has occupied a large portion of popular culture precisely because it has its fingers solidly on the pulse of our condition as men who feel we cannot escape the Modern, yet who realize that Modernism does not satisfy our souls. Again, so far so good, but what does any of this have to do with "what the atheist taught me about Christian culture"? Two words: Babylon 5. I could have picked nearly any modern science fiction universe as the centerpiece of this essay, but I have chosen this one because to my mind it more accurately than others represents the deep angst we moderns feel because of our unthinking evisceration of the transcendent, and it was in part meant to be an atheistic mirror image of one of the greatest Christian cultural achievements of the twentieth century (Tolkien's Lord of the Rings). For one who thinks in terms of worldviews and their complex relationship with the emotions and actions they inevitably inspire, there is one particular science fiction universe that stands head and shoulders above the rest: J. Michael Straczynski's Babylon 5. From the start we knew that Babylon 5 was not meant to be just another science fiction show. Straczynski said he had a definite story to tell, and that the show would tell that story for as long as the ratings permitted it to be on the air. Straczynski's plan was to do five seasons and no more. With some last minute intrigues and "fat out of the fire" machinations behind the scenes this was actually accomplished. No one had ever done this with science fiction, and no one has done it since (though it is yet very early since Babylon 5 as a series ended). Today there is every indication that like Star Trek before it, Babylon 5 has taken on a life all its own. In addition to several "canonically authorized" series of novels (some of which are quite good, I must admit 1) and two television spin offs (Crusade and Legend of the Rangers), there are comic books, toys, and numerous websites promoting everything from technical specifications of the spacecraft and weapons, biological and historical information about the alien races, music from the shows and TV movies, and original fanfiction. In short, Babylon 5 has become not only a culture in its own right, but a reflection of the prevailing culture that spawned it. By itself this recognition of Babylon 5's achievement as a distinct modern atheist cultural product / culture-shaper would not be noteworthy, but when evaluated from the standpoint of a comparison with modern Christian cultural products / culture-shapers, it indeed becomes a profound lesson. This will require some extended discussion, and I beg the reader's patience. Understanding worldviews and story is critical to the theme of this essay. For all his atheism's horrifying moral ambiguities (as is perhaps best expressed in the conclusion of the Shadow War in the fourth season episode "Into the Fire"), not only does Straczynski understand the incredible life-altering power of stories, but he tells his stories within a fully self-conscious, full-orbed, consistently-applied worldview. He is an atheist, but he is an atheist who knows what he believes, why he believes it, and how to go about making that plain to others in such a way that they are deeply, personally affected at all levels of their culture--art, science, religion, literature, politics, emotion, intellect. In Babylon 5 we see (oxymoronic as this may sound) the very soul of atheism, and we cannot help but react to it either positively or negatively. It either confirms our existing prejudices or challenges them with its subversive narratives--as all good stories do. The power of Babylon 5 is not in its special effects or its (frequently) well-written stories with pithy dialogue or (occasionally) well-acted part, but rather, in the basic worldview story it tells throughout its five seasons. Like all worldviews, including the Christian one, it is a complete mythology about man from his origin to his destiny. In the beginning was the Universe, and the Universe was conscious. Desiring to explore its own condition, it decides to generate a vast variety of sentient lifeforms who interact with each other in enormously complex ways. Races which would come to be known as the First Ones, races that begin when the Universe is relatively young, eventually reach through millions of years of evolution a state of existence that can only be likened to godhood. Having reached this exalted position, many of them "passed beyond the Rim [of the galaxy]" to explore "whatever lies in the vast darkness between galaxies". Two of them, however, remain behind to help guide the Younger Races, to help them achieve all the potential that their own evolutionary paths allowed for. These two First One guardian races, the Vorlons and Shadows, soon discover that they have irreconcilable philosophical differences about how the Younger Races are to be shepherded. The Vorlons believe that order and obedience can smoothly control evolution with a minimum amount of suffering. The Shadows believe in helping evolution along by fomenting chaos and war so that strong races will survive and evolve while weaker ones will die out. At some point in the far distant past, the Vorlons and Shadows declare mutual war on each other's messages and proceeded to literally use the Younger Races as pawns in their own selfish quests to prove the other wrong. For untold eons this war of the gods continues, going through roughly thousand-year cycles punctuated by apocalyptic battles that nearly always result in the apparent defeat and retreat of the Shadows. ("Apparent" defeat because even though the Shadows retreat, they do, ironically, achieve their goal of helping evolution wipe out weak races through war, leaving the Vorlons to guide the survivors for the next thousand years until the next big Battle). It seems that for most of this long conflict, even though they do not themselves understand the real nature of the conflict most of the Younger Races generally believe the Vorlons to be "the good guys" and the Shadows the "bad guys". Indeed, whereas the Vorlons are highly enigmatic and unapproachable, they do deign often to appear to the Younger Races as "angels of light"2, preaching goodness and order and peace, while the Shadows are by their very name and physical appearance (very much "spider" like) taken as incarnations of fear and evil. The Vorlons are generally associated with "Light" and the Shadows with "Darkness", both terms that are highly charged with moral significance (especially to modern Western people who despite all their silly denials of and slanders against Christianity are nevertheless still very deeply influenced by seventeen hundred years of Christian cultural dominance prior to the onset of "Enlightenment" in the eighteenth century). But as the story reaches its pivotal point (from the middle of Season 3 to the middle of Season 4), we discover through the intervention of the First One (quite literally the very first being in the history of the Universe to have achieved sentience, an alien named Lorien) the above truth about the Vorlon / Shadow conflict and their millennia of manipulation of the Younger Races. The force of the story, driven by its atheistic view of authority, simply asserts that it is time for this order of things to end because the Younger Races "have learned to stand on their own". The theme announced in the opening monologue of Season 1, that "the Third Age of mankind" has arrived, reaches its zenith when, with an enormous fleet of ships from all the Younger Races surrounded by a death-dealing Shadow planetkiller, the Human leader of the entire Younger Race resistance against both the Vorlons and the Shadows imperiously orders the gods to "get the hell out of our galaxy". Amazingly (inexplicably!!) the gods obey their inferiors and simply, with chilling finality, depart, taking all their agendas with them and leaving behind a vast number of loose threads for the Younger Races to figure out how to weave into a coherent cloth. Indeed, this very episode of the story closes with the Human leader and his wife conversing about how with the departure of the First Ones the mystery has gone out of the Universe, so now all that is left is for the Younger Races to create their own mysteries as they fumble about making their own mistakes rather than someone else's. The "children" have learned to stop their "parents'" foolish bickering by simply exiling the parents from reality. The fourth season's closing episode, "The Deconstruction of Falling Stars", gives us a panoramic view of the future of humanity--like the Vorlons and Shadows before the, Humans will eventually reach "First One status" and have their own period of guiding a new group of Younger Races--though hopefully the Humans will not make the same mistakes as their Vorlon and Shadow predecessors. Man began as simple "starstuff" (a reference to the idea that our bodies are made up of elements that were once blown out into the universe by supernovas and eventually, through planet formation and evolution found their way into us) and ends as a star-walking god, the true captain of his own soul and master of his own destiny. Now anyone who is familiar with the power of story, particularly of story that purports to explain the whole of existence (what is properly identified as "myth") can see that this is a compelling story. Essentially it taps into and thoroughly explores what might be called "the myth of growing up"--that profoundly disturbing experience we all must undergo. The power of mythology lies precisely in its ability to tap into such deep, fundamental aspects of human nature, and Babylon 5's vision of what it means for humanity to "grow up" is a bold (if ultimately hollow) retelling of this aspect of our existence. It's power lies in its radical faithfulness to its worldview--the story does not shrink, for instance, from the stark harshness of accepting that millions of years of murder and mayhem can be excused by simply noting that the murderers were right by their own standards but now it is time for someone else's standards to take over. In Babylon 5, truth, beauty, and goodness, the three faces of culture, are functions of social consensus, not loving, sovereign divine care. This is, of course, a profoundly irrational and self-defeating principle, but Babylon 5's redeeming virtue (so to speak) is that it is consistent with this premise of its worldview and so dramatically succeeds in telling its story. For those already disposed to accept a basically atheistic paradigm, Babylon 5 confirms their deepest convictions and encourages them to stare at the existential abyss and laugh--to make the absurd leap of faith from real ultimate meaningless to (supposed) real proximate meaning without batting an eyelash. For those hostile to atheism, Babylon 5 subversively challenges the non-atheistic worldview by sheer force of consistency to and honesty about its presuppositions. It "works" because it is not afraid to admit its biases and accept all the implications of them without fear or waffling or qualification of any kind. Not so with modern Christian storytelling. Modern Christians by and large do not understand the concept of worldviews, or the profound ways in which the Bible's worldview subversively challenges our very existence as moderns. Modern Christians are exactly that--mind-numbingly, heart-killingly modern. We presume to have All Truth, but we do not even understand our own worldview, the thing that makes our truth-claims possible in the first place. This central fact comes out in our cultural products. Recall Wilson's aphorism: "We Christians used to build great cathedrals; now we toss Gospel-frisbees". Is this not a true indictment of our failure to engage in any meaningful cultural activities? We mock the culture of non-Christian unbelief that we find ourselves in, but we have our own peculiar Christian versions of unbelief that we pursue with holy zeal. We fill the airwaves with the immature, emotional gushing of trite "ask-Jesus-into-your-heart" revivalism and "Holy Ghost laughter rallies", adorn our cars with inane bumper sticker slogans, and assault the New York Times Bestseller list with poorly written "thrillers" about how Christians will escape this mean old world of evil matter and history by God's equivalent of Scotty's transporter (the "Rapture") and let the world burn in the apocalyptic hell-on-earth predicted by our (foolishly) "literal" reading of biblical prophecy. Our problem, in a nutshell is that we hate the world we live in and desire to escape from it into a pure "spiritual" realm where there are no nasty bodies, no messy history, and none of that irrelevant culture stuff. Past generations of Christians, on the contrary, understood that this world is our Father's world, the theater in which His loving plan is being played out, the place for us to take His word and disciple the nations with the goal of seeing the whole earth filled with His glory. Our fathers in the faith took the Gospel to the nations and transformed them, creating what we in our boring, soulless modernity scoff at as "the Dark Ages" but which was really a magnificent (though quite flawed) incarnation of a theology that was really believed 24 / 7, not merely mouthed in church on Sunday. The Enlightenment tells us (contrary to Scripture) that "faith" is a purely private and emotional affair, an individual's own personal communion with the god of his choice, disconnected from all engagement with the world of matter and history. Amazingly, we believe this lie, and so we produce utterly irrelevant, baptized versions of the pop-culture that is all we know and all we love. We think that the disgusting mess of pottage represented by WWJD bracelets and Left Behind novels and cheesy "witness wear" and B movies with B actors is our last, best hope for answering the evil Secular Humanists who supposedly evicted us from the positions of real cultural power when they banned school prayer in 1962. Hating history as we do, we thus do not understand that those positions of real cultural power used to be ours by reason of the blood, sweat, and tears of generations of our faithful fathers, but that, ironically, we simply gave them up without a fight in our mass defection from a biblically powerful faith during the two centuries of decline beginning with eighteenth century Pietism, continued by the nineteenth century's Second Great Awakening, and culminating with the twentieth century's retreat of Christians into mindless, fideistic "Fundamentalism". We rail against the culture of unbelief that at least produces consistently atheistic (but moving!) stories like Babylon 5, but all we offer in return is a culture of unbelief that produces inconsistently Christian (and shallow!) trinkets that are here today and in the landfill tomorrow. Like God in secular stories, a real sense of the Christian worldview in modern Christian cultural products is conspicuous by its absence. In our haste to avoid worldliness we have abandoned the world itself to the atheists, but paradoxically all we can do is whine about the very evil we ourselves brought about through our unfaithfulness to the covenant of our God. Ironically, perhaps the greatest example in modern times of a truly Christian cultural product--one which even Straczynski the atheist acknowledges his debt to in everything from certain basic story elements to entire classes of characters--is one which the mass of we "true believers" revile as demonic simply because it has monsters and wizards in it--J.R.R. Tolkien's Lord of the Rings trilogy. Yet, any informed Christian (i.e., one who has bothered to actually read Tolkien's works, especially his Letters and the Silmarillion) can readily see the profound Christianity of the Lord of the Rings and understand with minimal reflection that the story not only taps into all the deepest themes of the human condition that the Bible itself deals with, but also satisfyingly answers them by resolving them into the loving, providential governance of the God who is really there and who is not silent--the God who does not let us sit in isolated enclaves and whine about persecution and intolerance while we read our Bibles in complete isolation from all that has come before our day, but commands us to go forth in the power of His name and baptize the nations, making them disciples. This is the true story of Christianity, but we modern Christians have forgotten it. Straczynski the atheist understands the provocative power of story. Atheist that he is, in writing Babylon 5 he also understood the enormous power of myth as it came out in the Lord of the Rings. Indeed, for all its flaws, Babylon 5 might justly be called "an atheist's answer to Tolkien". All the same themes are there: the dangers of power for both the mature and immature, the drive to grow up into what one can be by virtue of one's nature, the inexpressibly moving human attempt to engage with realities that transcend all understanding, the epic, ages long conflict between right and wrong, the passing of one Age into another with deep, saddening loss of beauty but great hope for the future, noble heroes and baseborn traitors, fierce wars and faithful loves, courage and fear, wisdom and utter foolishness. The difference, of course, is that Babylon 5 has no ultimate foundation for its presentations of these themes. It can at best merely borrow them from the very Christianity it subtly despises by making it just one more relativistic and ultimately futile attempt to grasp the ultimately unknown (and possibly nonexistent) numinous. As a cultural product of atheism, Babylon 5 "works" on one level because it is consistent with its worldview. This much, at least, is light years ahead of any contemporary Christian attempt to express the Christian worldview. But as noted above, worldviews are not self-contained--if they do not actually engage the reality they claim to explain, they cannot be said to succeed on the broadest possible level. 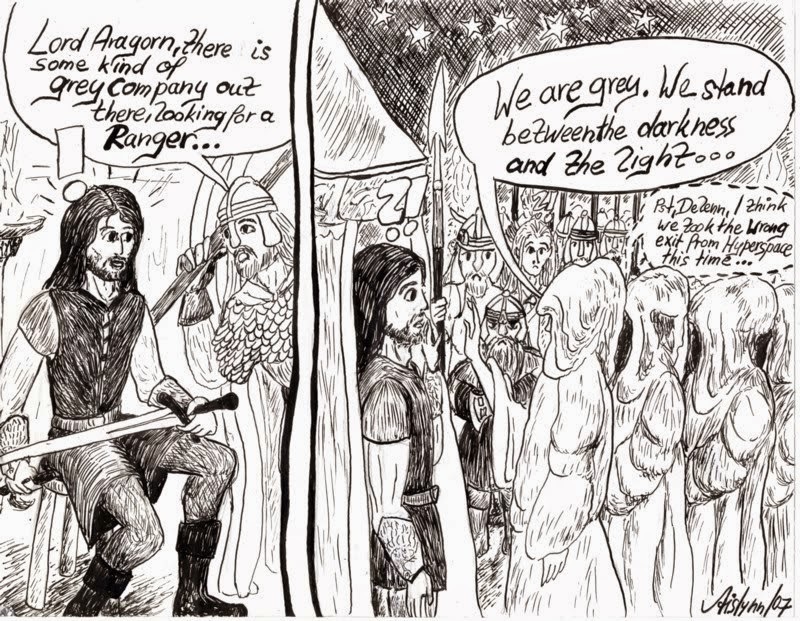 Tolkien successfully resolves the epic war between good and evil because good and evil are objectively definable entities--they are held accountable to a standard beyond the Circles of the World, Iluvatar (=God). Babylon 5, on the other hand, cannot successfully resolve its own epic conflict between "good" and "evil" because good and evil do not objectively exist for atheism. 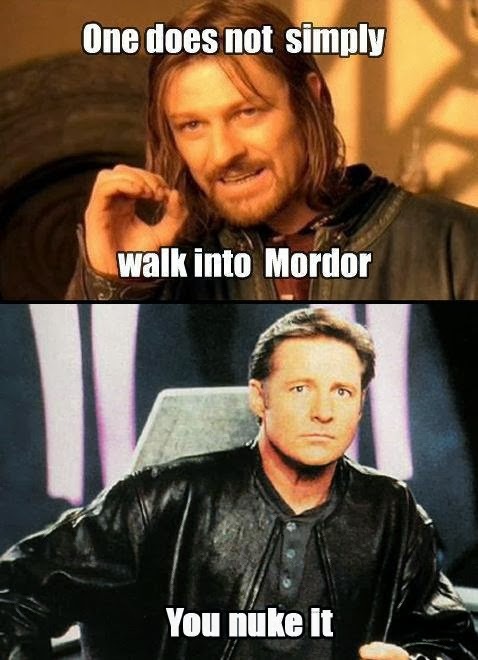 At the climax of the Lord of the Rings, Sauron gets what he deserves for his millennia of murder and mayhem; at the climax of Babylon 5, the murderers and mayhem-makers get off scot-free, and to the rousing cheers of "Good riddance!" by the Younger Races. As a bare story, Babylon 5 works because it is consistent with its worldview. As a realistic explanation of reality, however, it only works because it is tacitly relying on the small bit of remaining cultural capital from the now-defunct "Christendom" it pretends it has transcended. As a bare story, Tolkien's saga also works because it is consistent with its worldview. But as a realistic explanation of reality, Tolkien's saga works precisely because it is a legitimate, unashamed product of that Christendom, which itself gives the only really meaningful and finally defensible explanation of the human condition (original sin, gracious salvation initiated by God, redemption and transformation of the whole of the creation that was marred by sin). The Lord of the Rings is anything but a sermon, but its incredible staying power in the minds of millions of people who would not touch the Bible itself with a ten-foot pole is a dramatic--and unanswerable!--testimony to what is wrong with modern evangelical Christianity. But then again, so is Babylon 5. Nothing like Tolkien exists in today's Christian cultural enterprise, for we are too busy filling the shelves with absurd apocalyptic thrillers and the airwaves with absurd televangelism. When an atheist can produce better fiction than Christians, we all ought to see that we have been asleep and that we have lost something profound. People of all belief systems will watch and remember Babylon 5; only people within a very narrow, introverted slice of Christianity will watch and remember The Omega Code. The fact that modern Christianity's "best" cultural products are all in the class of the latter signifies the humiliating recognition that sometimes we can even learn the truth from atheists. 1. Particular two sets, J. Gregory Keyes' Psi-Corp Trilogy and Jeanne Cavelos' The Passing of the Technomages trilogy.